The foreign ministers of the Normandy Four group have reaffirmed their commitment to the Ukraine peace accords and discussed both the existing progress and the further steps required to ensure a long-standing ceasefire. An OSCE initiative that calls for more types of weapons to be withdrawn from the demarcation line, in particular weapons with a “caliber less than 100 mm,” as well as tanks, was also supported by the Normandy Four, Lavrov added. “We call on all sides to stop fighting and demonstrate their commitment to fully implementing the ceasefire and conclude the withdrawal of heavy weapons...we furthermore call for the withdrawal of mortars and heavy weapons below 100mm as well as all types of tanks,” the ministers said in their joint statement. Lavrov pointed out that all his colleagues supported the Minsk deal and declared the necessity of a “complete” ceasefire in eastern Ukraine, in addition to the withdrawal of heavy weapons. “We have also highlighted the need for the Minsk agreement to be observed in its full capacity, not only its military aspect, but also its political, economic and humanitarian [aspects],” Lavrov added. Lavrov also denounced Kiev’s ongoing economic blockade of the Donbass Region, where central authorities refuse to pay pensions and provide social benefits, as “wrong” and “harmful” to the Minsk accords. At the same time, some recent laws adopted by Ukraine, particularly the so-called “Decommunization package” and a bill that glorifies Ukrainian nationalists who have been accused of links to Nazi Germany, have “ruinous” implications for the peace process, Lavrov added. German Foreign Minister Frank-Walter Steinmeier meanwhile told reporters that there is “no alternative” to the Minsk ceasefire agreement in solving the Ukrainian crisis. “Nothing is easy in the Ukraine crisis, this is not new. During these talks today the differences of opinion between Kiev and Moscow also became clear once again,” Steinmeier added. The Special Representative of the OSCE Chairperson-in-Office, Ambassador Tagliavini, and the Chief Monitor of the OSCE Special Monitoring Mission, Ambassador Apakan, were part of the larger meeting on Monday night. Both were commended for their activities and urged to “finalize an operational concept on the working groups within the Trilateral Contact Group as soon as possible,” according to the ministers’ statement. 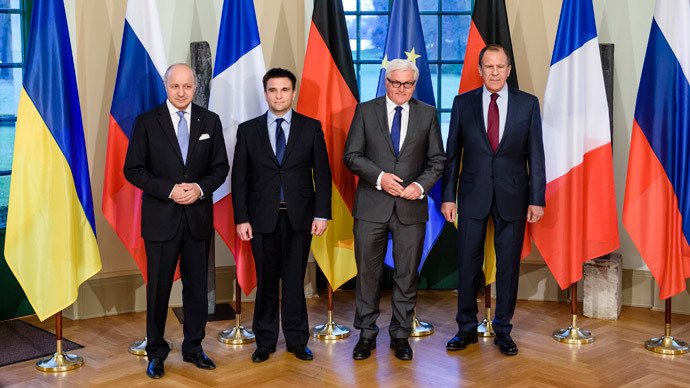 The so-called Normandy-4 group of foreign ministers from France, Germany, Russia and Ukraine met on Monday in Berlin to review the Minsk ceasefire agreement which has generally been holding up. The four gathered to assess progress in the context of the peace deal, which was brokered in the Belarusian capital on February 12. The ceasefire agreement included the pullback of heavy weaponry from the frontline by both sides in the conflict and the establishment of a security zone separating them. Since the start of Kiev’s military operation in eastern Ukraine a year ago, over 6,100 people have died while nearly have been 15,500 injured, according to a report released by the UN Office for the Coordination of Humanitarian Affairs (OCHA) on Monday.